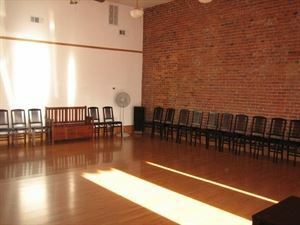 This facility is conveniently located in downtown Medford on 44 N. Front Street. It offers a 700 foot wood floor, mirrors, sound system, and a small lounge room. It is perfect for family reunions, small business meetings, bridal and baby showers, social gatherings, scout meetings, and holiday gatherings. The total occupancy is 49. $12 per hour with a minimum of 4 classes per month Please visit our website for more details. All rental fees are subject to change at any time.